The newest addition to the horror-themed slots machines, Monster Riches is meant to give you the shivers while you bet, spin and win coin prizes or hit huge slots jackpots. A gathering of spooky monsters is the perfect occasion for secret coin treasures to reveal themselves on the scary slots reels. Tip: Spin 3 or more Bonus symbols in any position to trigger the magic Wheel Feature. Into Frankenstein legend? Franken Bride is then the right slot machine for you – a thrilling casino slots game where famous characters are plotting for you to win the progressive minor, major or grand jackpot. 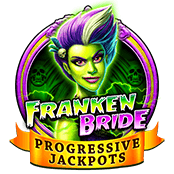 Tip: Bet, then spin at least 6 Franken Bride symbols to be rewarded free spins. The more Brides you unlock, the better – there are up to 40 free bonus rounds to win! What’s a Halloween slots party without an evil witch to spice things up at House of Fun? Play Wicked Evil slots game to feel the authentic Halloween atmosphere while her wicked laughter will accompany you when you spin the scary-looking reels for big wins. Tip: Find the emeralds, fill the meter and go after the big emerald progressive bonus. Vampires lurk around the House on Halloween. Hard to believe it? Play Vampire’s Kiss slot machine, cause believe it or not, if you manage to stay untouched by their deadly kiss, you’ll stumble upon great slots treasures and riches while you spin the Vampire’s reels. Tip: Find scatters on the reels 1, 2 and 3, and you’ll also land up to 8 free casino slots games in which this feature can be retriggered. High rollers or beginner players, you are all invited to the slots party, so hurry now as vampires, monsters, witches, and all scary things are gathering up on the reels of House of Fun, ready to begin the hunt for monster bonuses and prizes. Don’t be late, or you’ll be wickedly tricked! Treat yourself to a very lucky Halloween!